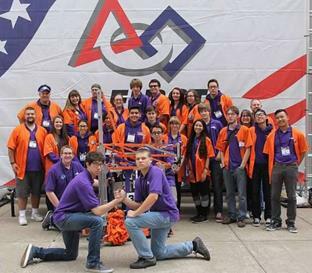 Team 399 Eagle Robotics of Lancaster High School has had yet another award-winning season! As a FIRST (For Inspiration and Recognition of Science and Technology) Robotics Team, the students are extremely dedicated and driven to promote Science, Technology, Engineering and Mathematics (STEM). Students have a six-week build season to design and manufacture a robot specified for the new game they receive the first week of January and another six-week competition season after that. Recycle Rush, the game for their 2014­-2015 season, involved stacking totes for points, capping the stacks with a recycling container and inserting a pool noodle, known as litter, into the recycling container. The team improved at every competition. At the Inland Empire Regional (Feb. 28­-March 1), Team 399 Eagle Robotics averaged a score of 47.65. Just weeks later at the Ventura Regional (March 27­-28), the team more than doubled its average with an 84.91 score. Team 399’s average shot up to 107.30 at the San Diego Regional (April 3-­4), where the team claimed the win in alliance with Team 2339 of the Antelope Valley and Team 3255 of Escondido. At the Inland Empire and Ventura Regionals, Team 399 Eagle Robotics was recognized with the Creativity Award. They also won the most prestigious award within FIRST, titled the Chairman’s Award, at the Ventura Regional. Winning the Chairman’s Award brought students and mentors to tears, because it acknowledged all of their hard work and recognized the team as being successful in promoting STEM. With this award and the San Diego Regional win, Team 399 double-qualified for the second year in a row for World Championships (April 23­-25) in St. Louis, MO. There were eight fields at World Championships this year and teams were randomly divided to be assigned to a field. When an alliance of three teams won in their division, they moved on to the Einstein Field, where playoffs took place. Eagle Robotics played on the Carson field; and after the qualification matches, they averaged a score of 131.3 points and were selected to be a part of the #6 seed alliance. The team narrowly missed moving on from quarterfinals to the semifinals by a 1.5 point average. 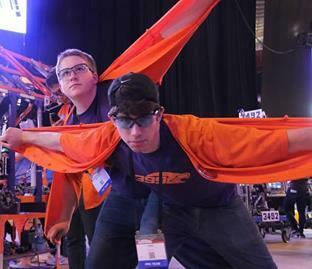 Going to St. Louis, though, was not just about the competition for Eagle Robotics. Team 399 hosted its 9th annual RoboProm – a dance for FIRSTers and the team’s biggest fundraiser – to nearly 2,000 guests. This year, they were pleased to announce their first RoboProm scholarship, which recognized a high school student who displayed significant achievements in both education and leadership through involvement on either a FIRST Tech Challenge or FIRST Robotics Competition team. Lauren Ehehalt from Grosse Pointe Woods, Michigan, was the inaugural RoboProm Scholarship winner. Also new to RoboProm this year was a photo booth, which was a big hit. Students interested in RoboProm court emailed an essay or video of themselves with a description on why they felt they deserved to make RoboProm Court. Winners announced at the dance were Kaitlyn Liveoak from Taylor, Michigan, and Safia Sindha from Waco, Texas. 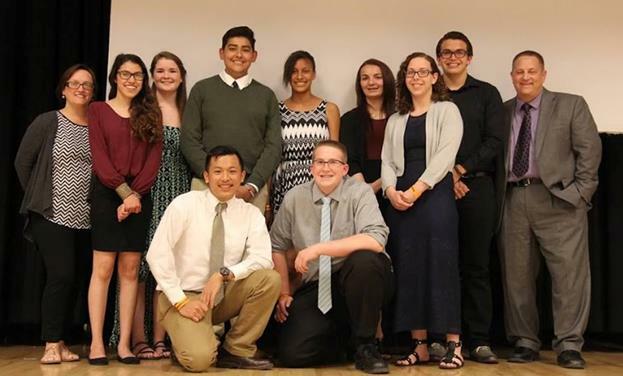 Families, students, and mentors gathered for the team’s end of the year banquet on May 8, 2015. Students were acknowledged by grade level, and team members received a new nickname that echoed their time on the team for the 2014­-2015 season. Student accomplishments were recognized, goodbyes were said to seniors, and Eagle Robotics’ new leadership team — consisting of five females and four males — was announced to an enthusiastic audience. “I’m excited to have a female majority on our new leadership for the 2015­-2016 season and look forward to seeing what direction the team will take,” stated Mentor Julie Voracek. Although the build and competition season doesn’t begin until January 2016, Team 399 continues to promote STEM and robotics. Their Summer Robotics Workshop is coming up June 22­-27. This workshop provides 5th-­8th graders of the 2015­-2016 school year an opportunity to get hands-on experience with robotics by designing, building and competing with a small scale robot in a game that Eagle Robotics designs. 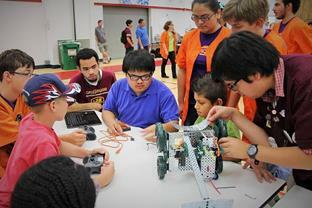 The Summer Robotics Workshop will be held at Joe Walker Middle School (5632 W Avenue L­8, Quartz Hill). A link to the application is available on the home page of the team website, team399.org. In order to sustain the team and ensure that all Eagle Robotics’ workshops remain free for participants, the team is asking for the public’s support at an upcoming fundraiser. The team will be having a garage sale from 7 a.m. to 3 p.m. on Saturday, May 16, at 3826 West Avenue J­10 in Lancaster. They’re calling on all local residents to come out and help Eagle Robotics soar! Eagle Robotics is made up of many devoted students like Matthew and several mentors, but more are welcome. If you are interested in becoming one of these students, sign up at team399.org. If you would like to learn how to become a mentor for Team 399: Eagle Robotics, email team399@gmail.com. No engineering skills are required to become a mentor. Students need your wisdom, life skills and experience to guide them. There is a need for more help as the team continues to grow. “I really enjoyed working with all the students, mentors and parents this season. This being my 10th season with the team, it has really been something special,” Lead Advisor David Voracek said. The team will be giving a demonstration on May 27 at Endeavour Middle School in hopes of recruiting more students for the 2015-­2016 season. If you would like to set up a robot demonstration or have any questions regarding the team, get more information on team399.org. You may also email them directly at team399@gmail.com or message their Facebook page, Team 399: Eagle Robotics.